OK, I know it’s been a couple of months since my last post, but my excuse is perfect – I’ve been travelling. Berlin has been on my wish list for years, so when the opportunity came up for a quick trip to Europe between visiting family in England I jumped at it. Three days, three people and barely a word of German between us. You can pack a lot into three days: the Brandenburg Gate, the Riechstag (book ahead for the tour), Checkpoint Charlie, the Jewish memorial (eerie, disturbing, amazing) plus a multitude of fascinating museums such as the DDR (what was life like for East Germans? ), the Topography of Terror (history and workings of the Nazi Party, the SS and the Gastapo), and the Bauhaus Museum (anyone who appreciates a teapot that doesn’t leak or a table that doesn’t wobble will love this museum about the Bauhaus design school). But while looking at monuments and historic buildings and admiring the distinctly German architecture is fascinating, it’s the ubiquitous street art that gives Berlin its soul. A walk around Friedrichshain and Kreuzberg and the famous East Side Gallery will explain why Berlin has become the European hub of street art. 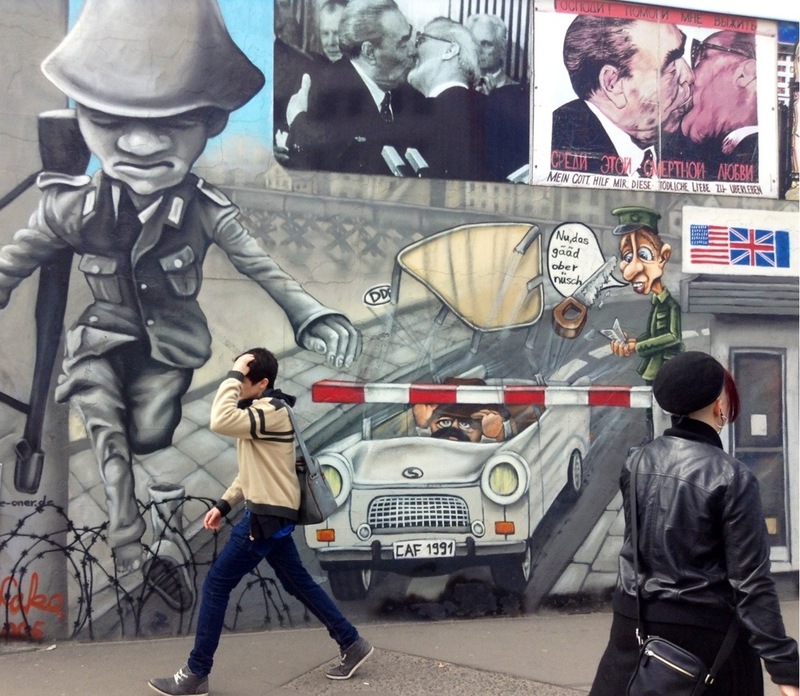 (Check out this guided tour of Berlin’s street art here). 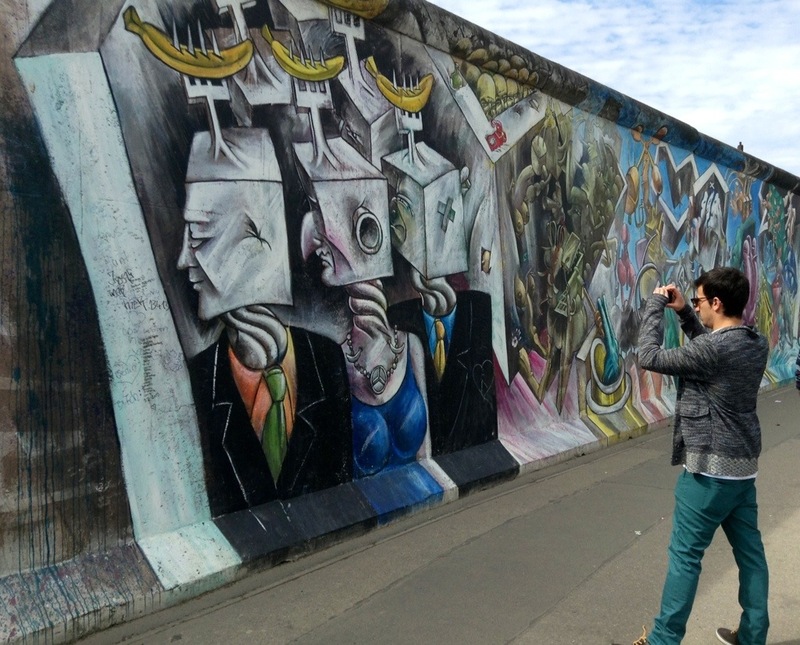 The East Side Gallery is an outdoor art space on a mile-long stretch of the Berlin Wall that still stands along the Mühlenstraße in what was East Berlin. It’s said to be the largest open-air art space in the world and has more than 100 original murals. A quick history: During the 1980s artists from all over the world used the west side of the Berlin Wall as a canvas for political comment and it became a symbol of free speech that was in sharp contrast to the bare grey slabs of the eastern side. When the Wall came down in 1989 much of that art was lost. (This website documents some of it before the Wall fell). Soon after artists from all over the world used the east side of the Wall as a canvas to express euphoria over liberation and hopes for a better, freer future. Here’s a selection from the East Side Gallery, followed by a few pieces from elsewhere in the city, taken with an iPad camera.